If you have an undergraduate degree with majors in agriculture or a related field, love a challenge, and want to develop professionally while contributing to rural development in a least developed country, this could be perfect for you! The Crawford Fund in association with the Australian Volunteers Program (AVP) of the Department of Foreign Affairs and Trade is seeking passionate and energetic Australians to fill volunteer placements as part of the Fund’s ongoing capacity building program in trade, crop health, biosecurity and food safety in the Lao People’s Democratic Republic (Lao PDR). 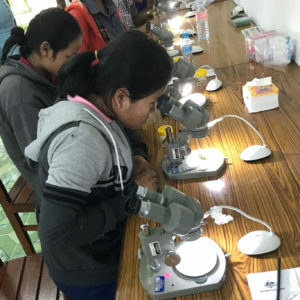 The Crawford Fund has been coordinating crop protection capacity building in Laos since 2009, to deliver training in integrated pest, disease and weed management, biosecurity and food safety. Workshops for farmers are also held to improve the safe use of pesticides – this was recently reported by ABC Radio. 1) Weed Management Advisor in a 12-month assignment (with a possible 6 months extension) that will commence in February 2019. The placement is with the Provincial Agriculture and Forestry Office (PAFO) in Savannakhet Province in southern Lao PDR. Weed identification with farmers in Savannakhet. Operating out of the PAFO office in Savannakhet, you would develop local knowledge and understanding of crop weeds. You would work with local district and provincial government advisors to build local capacity by demonstrating to farmers effective weed control practices in the field and assist in developing resources for training farmers in weed management. We are seeking a weed management advisor to increase the capacity of small-holder farmers to reduce weed impacts in rice. Weeds reduce yield and quality of rice, and limit adoption of new and improved crop establishment techniques such as direct-seeding. Most small-holder farmers still use hand-weeding for weed control in Laos, but labour is scarce and costly, and alternative control methods (e.g. tillage, crop competition, sowing weed-free crop seed) are urgently required. In the longer-term, to manage weeds effectively there is a need to introduce farmers and advisors to a range of cultural, physical and chemical methods for integrated weed management. Can we increase the adoption of sustainable direct-seeded rice production with minimal (or zero) use of herbicides? This assignment will help with weed recognition, impact assessment and demonstrate the effectiveness of integrated weed management in the field. The project will work closely with other projects examining improved crop seeding techniques for more efficient establishment of rice crops. 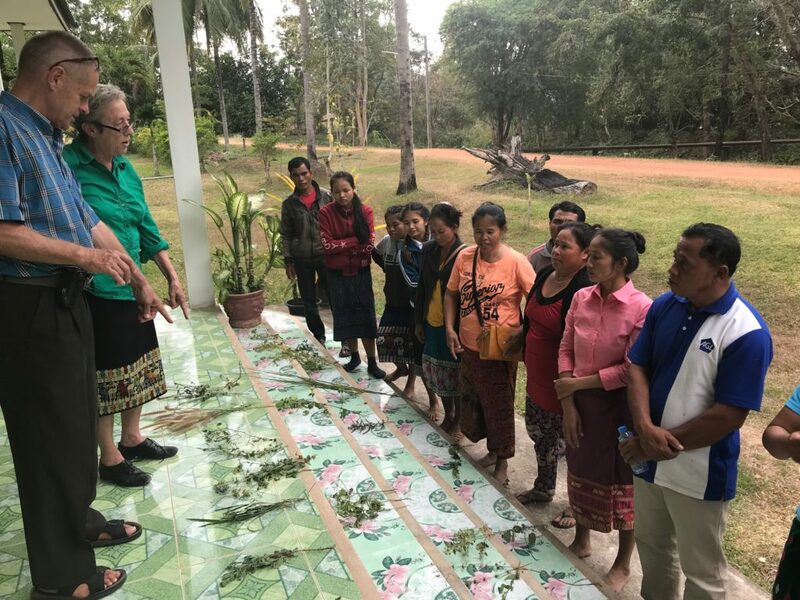 This assignment is supported by the Crawford Fund and extends on-going ‘Crawford Fund Capacity Building Program in the Lao PDR in Trade, Crop Health, Biosecurity and Food Safety’ to include weed management, and links with other Australian and Canadian volunteers at PAFO. Pests under the microscope at a farmer workshop. We have a number of positions as entomology and IPM advisors to be placed also with the Provincial Agriculture and Forestry Office (PAFO) but in Pakse, Champasak Province in southern Lao PDR. Operating out of a basic entomology and pathology laboratory, you would develop local knowledge and understanding of crop pests, diseases and weeds, and build local capacity to undertake diagnostics and advise farmers on management practices. More details are here. We also have a number of these positions assigned to the Provincial Agriculture and Forestry Office (PAFO) in Savannakhet city, Savannakhet Province in southern Lao PDR. More details are here. Volunteer assignments are funded and managed under the Australian Government’s DFAT Australian Volunteers Program. The goal of the Program is to contribute to sustainable economic growth and poverty reduction, and to advance Australia’s reputation and relationships in partner countries.